That’s what she told her virtual boyfriend, 18-year-old Conrad Roy, when he got out of the cab of his pickup truck as it filled with carbon monoxide one summer’s night three years ago. As he had when he tried to drown himself, Conrad Roy’s instinct to live overcame the horrible depression that told him to die, and he sought fresh air in the parking lot of a Kmart in Fairhaven. Carter was found guilty of involuntary manslaughter in the suicide of her boyfriend, Conrad Roy. But, some 40 miles away, in Plainville, 17-year-old Michelle Carter told Conrad he had to go through with it. He had put it off too long. He had to stick with the plan. Those were the words that persuaded Judge Lawrence Moniz to convict Carter of involuntary manslaughter at an extraordinary sitting of the Bristol County juvenile court in Taunton. Those three words, and the fact that Carter sat there with her phone in her hand that day, listening to Conrad Roy draw his last fitful breaths, instead of using that phone to summon help. Moniz’s decision, which was followed nationally if not internationally, had all the drama of the climax of a ripped-from-the-headlines television show. Carter seemed to sense her fate. As soon as Moniz began to speak, she began to cry. Her pessimism seemed warranted when Moniz began by saying that the Commonwealth had proved beyond a reasonable doubt that Carter’s actions, including her constant encouragement of Roy to kill himself, constituted wanton and reckless conduct, the standards required for an involuntary manslaughter conviction. But in the next breath, Moniz appeared to throw Carter a lifeline. He said the Commonwealth had not proved that her conduct had actually caused the death of Conrad Roy. At this point, both Carter and her attorney, Joe Cataldo, gripped each other, thinking they had prevailed. The judge began citing the defense’s talking points: that Conrad took significant actions of his own to kill himself, that he researched how to do it, that he bought the generator that would produce the lethal gas, that he parked his Ford F-250 pickup truck in a remote part of the Kmart parking lot. That Conrad Roy could have survived the day he actually took his life and then succeed in killing himself on some future date “is of no consequence,” the judge said. And then, showing how much research he put into a decision that he knows will be scrutinized closely and appealed probably all the way to the US Supreme Court, Judge Moniz cited a case in Western Massachusetts from 200 years ago when an inmate at the Hampshire County jail was charged with encouraging a fellow inmate to hang himself. The inmate who hanged himself was due to be executed by hanging six hours later for killing his father. Moniz agreed with that sentiment. “When he gets out of the truck, she instructs him to get back into the truck,” Moniz said. She did this, he said, even knowing Conrad’s fears and reluctance and ambivalence about actually going through with suicide. “Ordering him back in the truck constitutes wanton and reckless conduct,” the judge said, and when he said that, I knew Michelle Carter was guilty. So did she. She put a tissue to her mouth and held it there, staring off at something that might have been freedom. 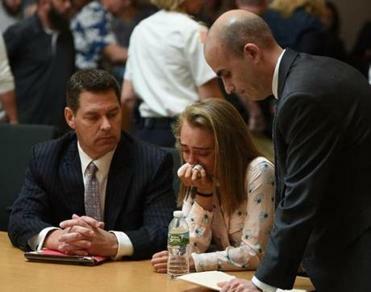 The judge noted that Michelle Carter had gone out of her way to obtain the telephone numbers of Conrad Roy’s mother and sister in the days before his suicide, but she didn’t call them after Roy had second thoughts and got out of the truck. “She called no one,” the judge said. “Please stand,” Moniz said. When he declared Michelle Carter guilty, she looked confused and asked Joe Cataldo what it all meant. Bristol County prosecutor Maryclare Flynn asked Moniz to revoke Carter’s bail, saying she should be locked up to await sentencing because she’s a danger to herself and others. But Moniz sided with Cataldo’s argument that she has been cooperative with the long legal process and never failed to appear in court. Pending her final sentencing, Moniz sentenced her to social media isolation: no texting, no Facebook, no Snapchat, no nothing. Left unsaid is that if Michelle Carter had not had access to the weapon she used, her cellphone, Conrad Roy wouldn’t have killed himself that day. There will be a time to argue whether someone who is as unstable as Michelle Carter appears to be is better served by a prison cell or a psychiatrist’s chair, but Friday wasn’t that time. There will be a time to call on legislators to craft a law that removes all ambiguity, making it explicitly illegal to encourage someone who is clearly reluctant to kill themselves, but it wasn’t Friday.